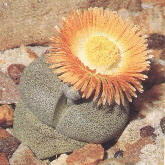 The Mesemb Study Group exists to encourage the study and knowledge of the plants of the family Mesembryanthemaceae (commonly known as Living Stones). The Mesemb Study Group (M.S.G.) was formed in 1986. In its first twenty years the group has grown to include around 600 members in many different countries. The group is run rather informally and its aims are to further the study and knowledge of the Mesembryanthemaceae. A bulletin is issued quarterly to every member in January, April, July and October which is mailed around the fourth week of the month. With the July 1988 bulletin came the first colour illustration in the form of a 'stuck in' photograph and there are often line drawings. Since 1992 the colour illustrations have taken the form of 2-6 pages of four or five colour pictures. The current years issues will contain about 20 colour plates. A recent example (81K) can be seen here. More pictures can be seen by clicking here. The bulletin averages about 25 pages. Membership of the Mesemb Study Group is open to anyone. The cost for 2019 is £12 for UK, £15 for Europe and £21 for other countries. You can join or renew online using PayPal or Credit card. See our sales page for back numbers and other items.